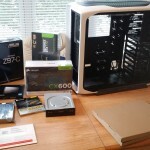 Last April I helped one of my friends build a nice gaming PC. 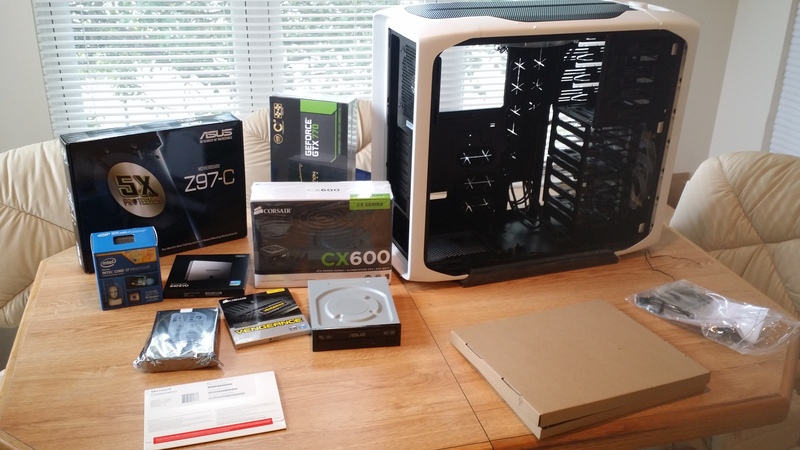 This time I am helping a friend and co-worker build a new gaming PC. I am pretty happy with the results we got considering the cost. We managed to pick up quite a few of the components for a good price + rebates. If you compare this to last year’s build, you will see a number of similarities. Both of them are in the Corsair 600T, an incredibly well designed case thats a pleasure to build in and looks great. 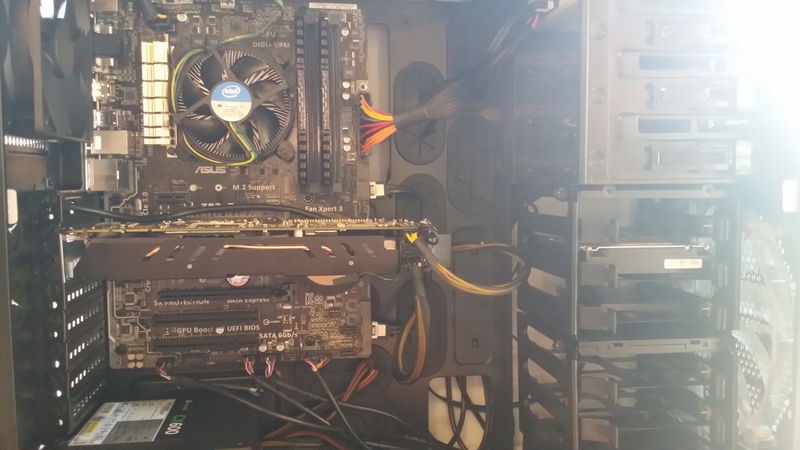 They also both have 16GB of Corsair Vengeance DDR3 memory, a 3TB Seagate drive for storage, and a 120GB SSD for the operating system. Last year the SSD was an entry-level OCZ Agility 3 drive, this year its an entry-level Samsung 840 EVO. The EVO is not a high performance SSD by any measurement but any SSD is better then a typical mechanical HDD, and for the price the EVO is pretty great. We used the ASUS Z97-C Motherboard for this build for two reasons: it has the new 9 series chipset and its fairly cheap for what it provides which allowed us to spend most of the money on the parts that really matter. The 9 series board is nice for a couple of reasons. First, it supports the M.2 spec as well as SATA Express. There are not many devices that support it, but going forward expect to see a lot of the high end SSDs use it. The approximately 67% increase in speed should help with SSDs being bottle-necked by the SATA 6Gb/s performance. Second, the 9 series motherboards will support the upcoming 14nm Broadwell based CPUs. Most 8 series boards will not support them despite Broadwell being LGA1150 due to new power requirements for the CPU. The i7-477k is the modern equivalent to the 3770k I used last year, and the reasoning for using it over the 4670K is still the same: while the hyper threading might not matter too much right now, it is certainly going to start to matter as more games are developed for the new consoles with their 8 core processors. The CPUs in the new consoles have fairly slow clock speeds, so in order to get acceptable performance the games are going to have to be heavily threaded. Game developers didn’t have much incentive before to make their games use more then 4 threads, but they have a pretty big one now. We went with the PNY GTX 770 because its a pretty great card. 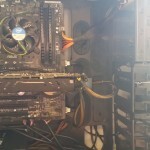 It maybe doesn’t have the value-to-performance ratio that the 760 does, but it was within our budget and we wanted to build a pretty nice PC so we went for it. Normally I wouldn’t have suggested a 4GB card over a 2GB card for 1080p gaming, but the 4GB edition did not cost much more. Plus, it might start being beneficial for similar reasons as above: the new consoles have 8GB of unified memory so they might start requiring more VRAM. One example would be Watch Dogs, which requires at least 3GB of VRAM for the highest quality textures, even at 1080p. Throw in some high quality anti-aliasing and you can see how having more then 2GB could be beneficial. As for why we went with Nvidia over ATI, Nvidia has a lot of interesting things going on right now such as GameWorks, PhysX, G-Sync, Geforce Experience, and ShadowPlay. The rest of the build is fairly uninteresting. A DVD drive for the convenience of installing Windows and the off chance he actually buys physical software, and Windows 8 Professional. We went with professional simply because he wanted the ability to RDP into his desktop.